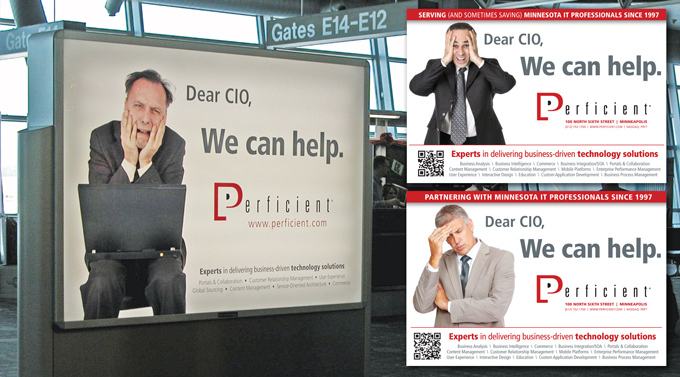 Perficient: Airport Signage - TriFecta Creative. Graphic Design and Creative Services for Your Business. Our client needed a series of basic corporate brand awareness signs. Basic strategy involved was to begin local awareness of the client’s brand, logo and general industry information. We worked with the client’s “We can help” idea to conceptualize and create additional text and imagery to complete their message. Sign series feature three versions that were built to three different sizes. Signs were large format, back-lit displays installed at Lambert International Airport in St. Louis and later added at Minneapolis – St. Paul International Airport based on the success of the initial campaign.